This is an opportunity for an experienced Radiographer in Nuclear Medicine to join our friendly team at The Princess Royal Hospital, Telford. We are looking for an enthusiastic, flexible and highly motivated Radiographer to work in the Nuclear Medicine and general teams. This post also includes rotation through the general department which involves all aspects of General Radiography as well as CT scanning of the head and neck, in addition to working in the Nuclear Medicine suite. The successful applicant must have a BSc (Hon) Diagnostic Radiography or DCR and have current HCPC registration and previous experience in Nuclear Medicine. It is desirable that the applicant has previous experience in an NHS Hospital. Where the applicant does not have any previous experience in Nuclear Medicine, but has a keen interest in training in this area, we will consider employing at a band 5 level and progressing to Band 6 on completion of competencies in this modality. The successful applicant would be expected to participate in a busy general rotation including cross sectional imaging, participation in the on-call rota and 7 day working. 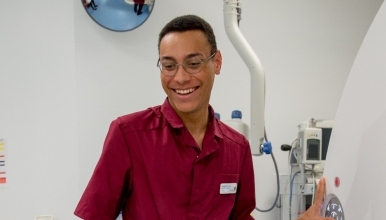 All Radiographers with more than 1 year Post Graduate experience contribute to the training and mentorship of undergraduate students and Assistant Practitioners and the department has an excellent on site teaching environment. The department is fully committed to role extension and has Consultant Radiographers supporting our teams into advanced practice including Ultrasound, Barium Swallows, CT Colonoscopies, CT head and plain film reporting. We are committed to the development of our teams, including extension into advanced practice, under the guidance of our Consultant Radiographers - striving to provide quality imaging for our patients.